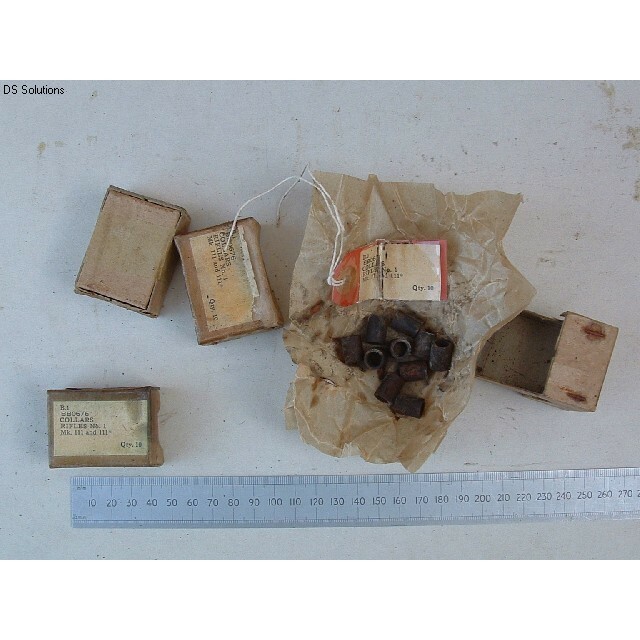 These are original, unopened stores boxes of 10, collars for the front trigger guard screws of most Lee Enfield series rifles including SMLE No1 Mk3 and the No4 series rifles. When used on L39A1 & L42A1 Rifles these were termed 'Spacer Sleeves'. The collar fits into the screw hole in the underside of the fore-end between the screw lug on the underside of the receiver and the top face of the trigger guard. The front trigger guard screw fits through the collar and clamps it between the 2. When filed to the correct length for the individual rifle these ensure that the trigger guard is secure in the fore-end without crushing the wooden fore-end or distorting the trigger guard. The collar is also important for limiting the movement of the trigger guard when the fore-end shrinks or expands during dry or wet weather, therefore keeping the trigger pressure more or less the same. The collars are steel and have a phosphated or chemically blacked finish. 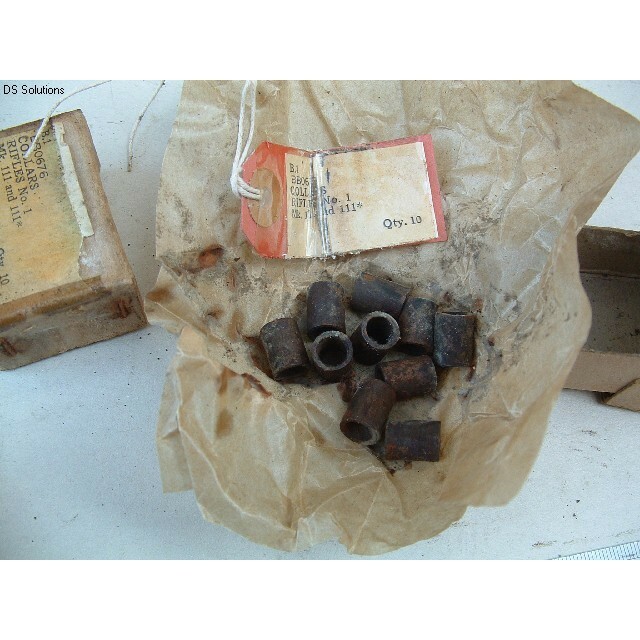 Due to having been stored for an undetermined number of years in unknown conditions it is possible that some collars will be found to have some storage deterioration such as light surface rust (easily removed with an oiled rag) when opened. Others may be packed in grease. These are unopened boxes and so you take the same chances as us! Unit of sale 1 box of quantity 10 collars. 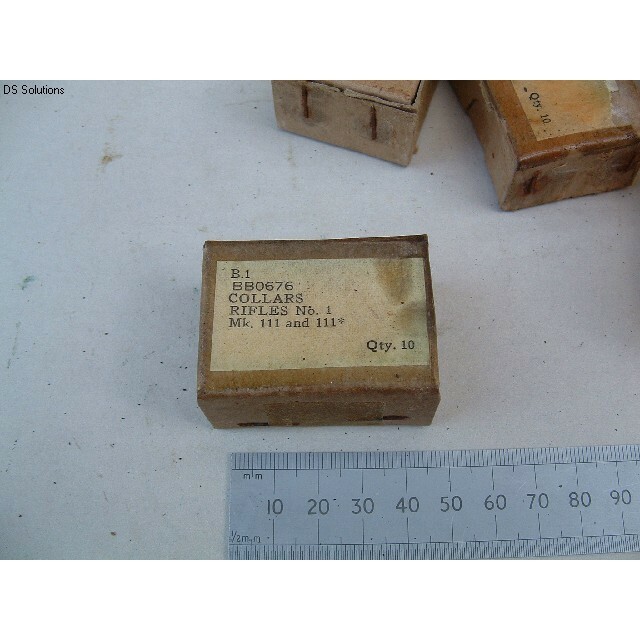 British Army Part Nos BB0676, B1/CR344 or NSN B1/1005-99-961-8361.